Disk oder Tape — worauf speichert man heute Archivdaten? 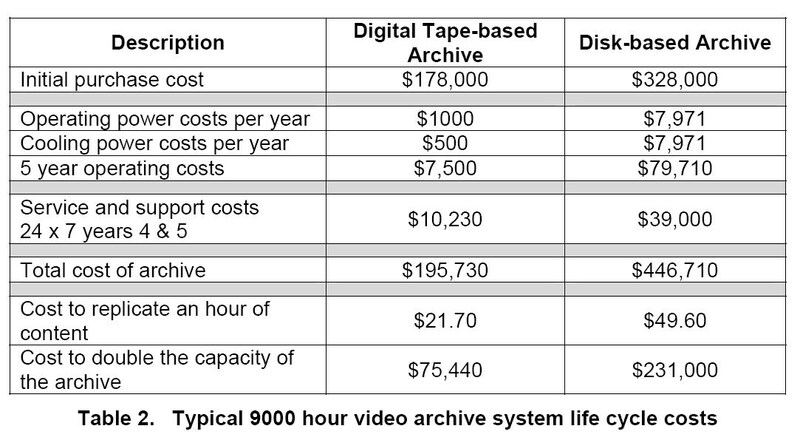 Tape is always much less expensive than disk and always uses much less energy, when measured on a per petabyte basis. However, if the time required to retrieve any of your vast, long-term archived data needs to be a few seconds or less, then archiving to disk may be best, but will be much more costly. The best solution is really a blend of disk and tape, but — for most uses — we believe that the vast majority of archived data should reside on tape. Man könnte hinzufügen: Nur Google's Filesystem,welches eine Kopie des gesamten Internets ausfallsicher auf Commodity Disks hält, scheint ein Ausnahmefall zu sein. Migration to a new generation of disk systems typically becomes necessary every 3 to 5 years. Tape technology has a longer cycle of about 7 years. Tape, if handled correctly, can last 15 or more years. In general, tape offers between 4 and 6 times the life expectancy of disk (with media manufacturers specifying up to 30 years for LTO tape). The shelf life of disk is significantly shorter: Idle disks may start to lose data and start to demagne­tize after 1 or 2 years already unless they are spun-up every 30 days. Wissenswertes zu "Archivdaten, Tape, Disk" zusammengestellt durch Gebhard Greiter. Archivdaten . Praktisches . Kritik : News?